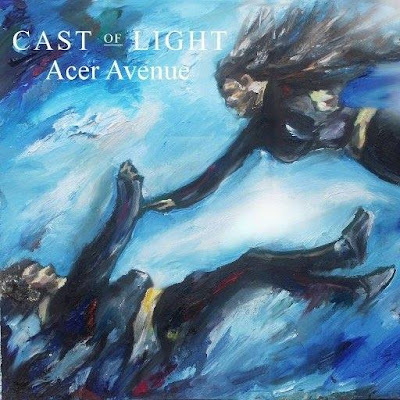 In the same vein as my post earlier about the upcoming The People The Poet EP, Reading based pop-folk band Cast Of Light are releasing their Acer Avenue EP digitally on Friday 1st April too. They released the EP physically at a February Tigmus show they supported on, and with the digital release just around the corner, I was sent a link to listen to the EP. Though I'd heard of the band through seeing their name on the line-up for the Tigmus show back in February, I hadn't listened to them before but I'm digging the EP. A quick look at their Facebook page and I can see recommendations to fans of artists such as Imagine Dragons and Of Monsters & Men, with their Soundcloud page reading "imagine Bastille infused with Noah & The Whale, Frank Turner and Ed Sheeran" - the Noah reference has me sold, to be fair... You can listen to Youth, the second track of the EP, below, and there are some older tracks from the band here. The EP is pretty lovely all round with the opener, A Time Will Come, building slowly into a brass section (I could be lying - my music detection skills aren't spot on), definitely like Of Monsters & Men or Mumford & Sons in style, a big track. Youth, the above track, is upbeat and fairly catchy, contrasting folky acoustic guitar with an almost rock-like chorus of powerful vocals, something mastered by many of the influences mentioned above. The title track opens slowly and is fairly reserved, but grows in momentum towards the end. The tracks all have in common a contrast, and a fairly nice mixture, between a 'big' sound, and personal vocals. The vocals take the forefront throughout the EP, standing out and placing focus upon the lyrics, making you feel as if you could have been transported to a Cast Of Light concert, standing less than a metre from the stage. Keep an eye out for the digital version of the EP which will be released (on iTunes etc) on Friday 1st April. If you're more of a fan of physical music, you can grab the CD version of the EP already here - limited to 100 copies and certainly worth it for that beautiful artwork!